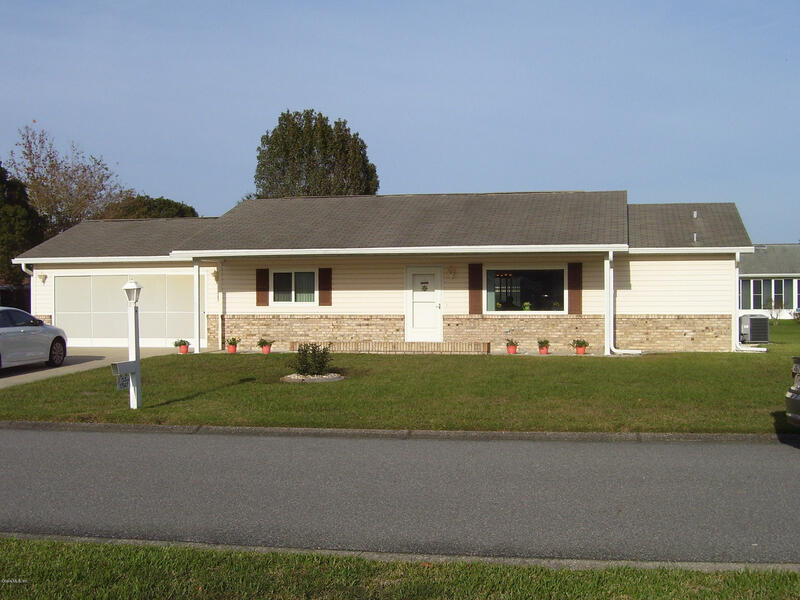 17947 SE 105 Terrace, Summerfield, FL.| MLS# 546806 | Spruce Creek Realty...Retirement Communities in Florida, Resale Homes In Spruce Creek South, The Villages, Stonecrest, Del Webb. Extended Fir Model, split bedroom plan w/vaulted ceilings in Living/Dining Rooms in immaculate condition. 1294 sf of living area under house roof/heat/air, including 15x10 Florida Room off Dining Room at same level as rest of home. PLUS a 120 sf enclosed Lanai w/acrylic windows leading to a 10x10 patio. Oversized 24x20 garage w/recently painted floor. New windows in Living Room & both Bedrooms in 2018. New A/C in 2016, roof in 2004. Newer refrigerator, range, washer, blinds, storm door, hot water heater, toilet, shower head, outside lamp post, bedroom fans, down spouts & river rock landscaping - all this & more is new in last 3 years. Interior of this impeccably maintained home was recently painted and is ready for a new owner.